Alright, I’ll say it: these tacos are out of this world. But it’s Tikka Tikka Taco with their awesome spice kits and terrific menu who deserves the credit. If you caught season four of The Great Food Truck Race, these tacos will look very familiar. I won’t spoil the ending, but I will say that you’ll see the guys behind the truck whipping up a ton of orders throughout the show. The Tikka Tikka Taco Spice Kits make it easy to recreate a few of their signature dishes at home. Just add a handful of additional ingredients that’re probably already in your pantry and a few minutes of easy prep work! Even though I cooked the chicken under the broiler this time, it’s definitely a great dish to keep in mind when you’re ready to fire up the grill — my mouth waters even more at the thought of it cooked over charcoal! To hold all of the sautéed garlic spinach, flavorful chicken, creamy, cooling raita and cilantro-sprinkled goodness, I definitely recommend whipping up a batch of homemade, gluten-free flatbread. It’s worth it. However, feel free to swap in your favorite, non-corn tortilla (perhaps these from Udi’s?) or serve it all over a pile of fluffy, steamed rice. Basically, just order a spice kit and get cooking; you’ll be glad you did! Share your ideas for using these terrific spice kits in the comments or on Facebook or Twitter. And while you’re at it, definitely go give Tikka Tikka Taco a like and follow! In a 1-gallon zip top bag, mix/mash together red spice through ginger. Add chicken, and squish everything together until coated. Press out air, seal bag and refrigerate for several hours (preferably overnight). Once chicken is through marinating, remove from fridge and mix in the 1/2 cup yogurt; set aside for about 30 minutes (at room temp). While yogurt does its thing, arrange oven rack about 3″ from broiler and preheat broiler to high. Line a large, rimmed sheet pan with nonstick foil; set aside. 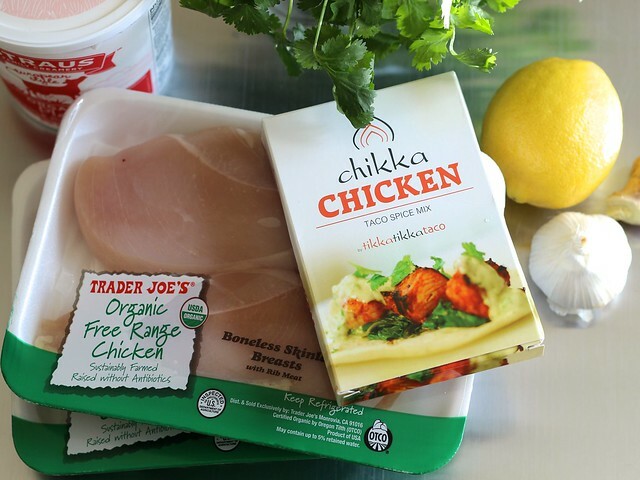 Arrange chicken, shaking off excess marinade, in a single layer on the prepared sheet pan. Place under preheated broiler and cook until browned in spots and cooked through (165°), about 10 – 12 minutes. While chicken marinates (or cooks), make raita. Whisk together gray spice and 1 cup yogurt. Refrigerate until ready to use. About 5 minutes before chicken is done, make spinach. Place a large skillet or sauté pan over medium heat, and warm oil until shimmering. Stir in spinach, and cook, stirring often, just until spinach is wilted. Remove from heat. 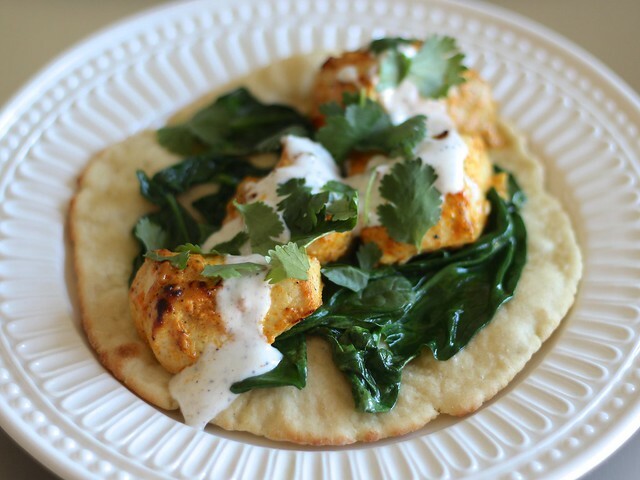 Divide spinach between the warm flatbread, top with chicken, a drizzle of raita and generous sprinkle of cilantro. Serve immediately! Dying to try….but I don’t want to wait for my shipment of spice packets. Can you buy these locally? Or suggest a homemade spice mix that might come close to the awesomeness of Tikka Tikka? Totally understand! Unfortunately, I haven’t had much experience with this type of spice mix beyond the packets (and dining out), and am not privy to their secret blends :). The gents behind Tikka Tikka Taco might be able to help you out with alternative blends or locating their product locally — their contact info can be found here. With that said, I’m so sorry that I couldn’t be more helpful. If it’s any consolation, I will say that I placed my order and had the product delivered in only 2 – 3 days!